Ryuko's mysterious homeroom teacher. He has a habit of taking his shirt off. 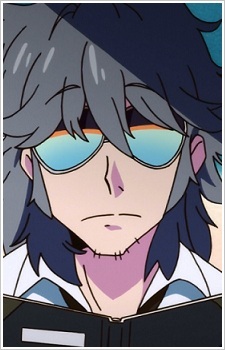 He works for an organization known as Nudist Beach and his job as a teacher is just to go undercover at the academy. Cosplay is an anime fan's way of saying I love you. Kill la Kill is an epic anime with tons of devoted fans worldwide. And what would a devoted fan be if they had the looks and ability to bring the Kill la Kill fantasy world to life and didn't? Come check out some amazing Kill la Kill cosplay! MomoCon 2016: The Cast of Kill la Kill Speaks! On day 3 of MomoCon, five of the Kill la Kill English dub's cast sat down for an informal panel about the show. As expected of Kill la Kill, things got goofy quick. These are excerpts from that hilarious hour with Erica Mendez, Laura Post, Ben Diskin, Matthew Mercer, and David Vincent!